of a hormone usually at the receptor level. In this case, a mimic of an active site of the ligand, if it is a peptide, can be synthesized and chemically stabilized. This agent will bind to the receptor and often block the further action of the receptor; this approach can be effective against growth factors that are required for rapidly growing cancer cells, but much less deleterious to mature normal tissue cells that either do not divide or do so at a very slow rate. This is a variation of the well-known approach of using a competitive inhibitor of ligands for steroid receptors when the steroid is required for growth of the tumor, which is often the case for estrogen receptor-positive tumors requiring estrogen for growth or androgen-positive prostate cancer cells requiring androgens for growth. Some of the cell types in these heterogeneous tumors will not express steroid receptors, and their growth will be steroid independent. Removal of glands that produce hormones required for the growth of tumors is still sometimes used, most often with the ovary, testis, adrenal and pituitary. In some cases, gland removal leads to a marked regression of the hormone-dependent tumor, for example, in breast cancer when the tumor has been demonstrated to be estrogen receptor positive and progesterone receptor positive (indicating that estrogen is required for growth and the estrogen receptor is functional in inducing the synthesis of the progesterone receptor). 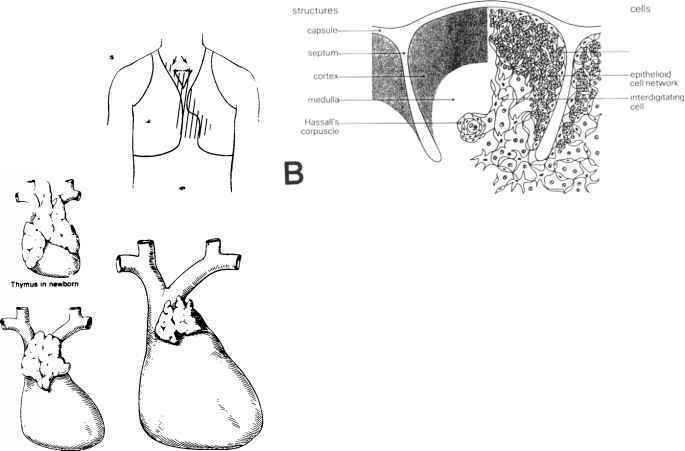 Thus, ovariectomy can be used to treat estrogen receptor- and progesterone receptor-positive mammary tumors. The endogenous levels of estrogen fall shortly after ovariectomy, and a response can be expected in certain involved tissues, such as soft tissues, lymph nodes, and lung metastases, but metastases to liver and brain do not respond. Removal of the testes is sometimes done for prostate cancer, but the results of this maneuver are not much better than for treatment with estrogens and in some cases antiestrogens (tamoxifen). Tamoxifen is being used more frequently for the treatment of both mammary cancer and prostate cancer. It is an antiestrogen, and in this regard its beneficial effects may be more understandable in breast cancer than in prostate cancer. However, it is possible, as seems to be the case in mammary tumor cells, that tamoxifen shuts off the supply of autocoid polypeptide growth factors, and this action may also be true for prostate cancer cells. In the mammary cell, estrogen may account for the increase in growth by stimulating the release of growth factors such as tumor growth factor a and insulin-like growth factor, and negative growth factors like tumor growth factor ¡3 may be inhibited by estrogen. Clearly, the action of tamoxifen can interfere with these effects of estrogen and result in the inhibition of cellular growth of the tumor. 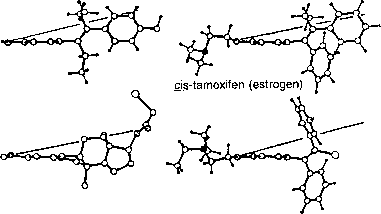 The structure of tamoxifen is shown in Figure 20-4.